The old saying says, it is always better to give than receive. Since most people enjoy both giving and receiving, donating to charities will allow you to give and receive at the same time. Contributing monetarily or by donating possessions to charities can be extremely helpful in receiving tax deductions while helping others at the same time. There are a few rules that need to be followed when donating in order to receive the most deductions allowed. Below are some helpful tips. The IRS only permits deductions for donations of clothing and household items that are in good or better condition. For each item donated, you need a specific detailed list of what you donated. You report itemized deductions on Schedule A on your federal form 1040 using lines 16-19. A contribution is deductible only in the year it is paid. Only donations to qualified charitable organizations are deductible. The organization must have a determination letter from the IRS. Many organizations post their letters to their websites. If it is not posted, call the IRS number to determine if a charity is qualified. The number is 877-829-5500. You cannot deduct contributions made to individuals. This includes handouts to the homeless. You need a receipt for any item or cash amount donated. Everything donated must be documented. The receipt needs to have the name of the charity, the date and the amount that was donated. If you donate $1000 in clothes or other goods, you may receive $250 in tax savings if your are in the 25% bracket. For most people the limits on charitable contributions do not apply. However, if you contribute more than 20% of your adjusted gross income to charity, it may not all be deducted. If the contribution is made to a public charity, the deduction is limited to 50% of your contribution base. Be careful when valuing a donated item. This especially applies to donated vehicles. You can only deduct the amount the charity receives from the sale of the car. If you donate property owned for more than one year, the value of the deduction is equal to the property’s fair market value. The Rollover allows individuals who are 70 ½ years old to donate up to $100,000 to charitable organizations directly from their IRA without that donation being counted as taxable income when it is withdrawn. To qualify, contributions must come from a traditional IRA or Roth IRA account. If your employer participates in a charitable program which allows you to make contributions directly from your paycheck you need to retain a pay stub or W-2 showing the amount withheld as a charitable donation along with a pledge card that shows the name of the charity. The information presented above does not represent tax advice. Remember to speak with a tax professional before taking any deductions on your tax return. 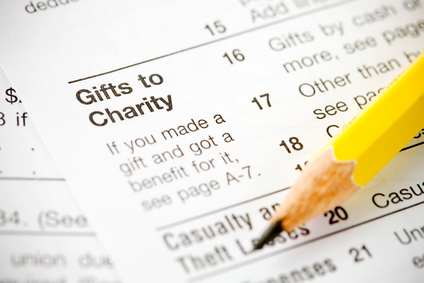 Hopefully these hints will help you receive beneficial charitable tax deductions. If you need help deciphering what is or is not taxable please contact Scott Horewitch Pidgeon & Abrams, LLC at 847-850-5300. Clear out your closets and donate! !